SeizureTracker.com - Logging a Daily journal on Seizure Tracker. 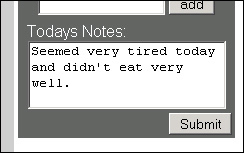 The daily notes tool is located on the right side of the Seizure Logging page. Simply enter in your textual notes and click submit.